Tickets are extremely important in a lot of circumstances, including when riding on a public transportation, such as a bus or a plane. 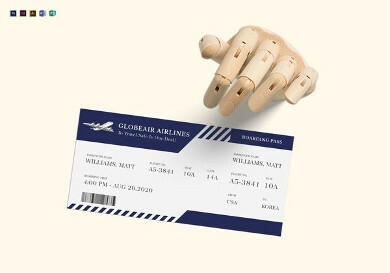 While an airline ticket is primarily used to verify if a person is entitled to a seat on an airplane, it can also be used by the company to showcase its branding. Hence, it is important that a ticket must be carefully designed as it reflects the personality of the company issuing the ticket. Not sure what’s the first step to take in designing a ticket? 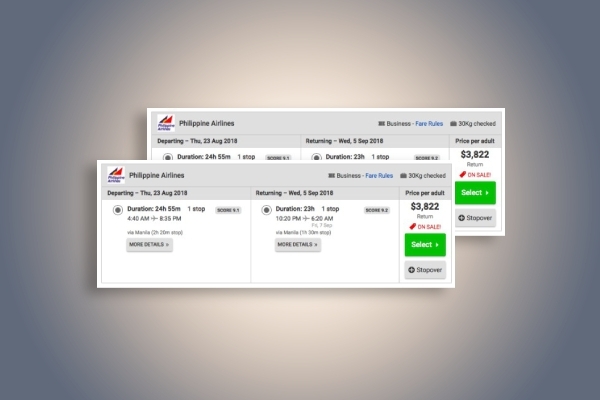 Here are airline ticket templates and examples that you can refer to. If you are the type of person that can’t get enough of classic or retro designs, this vintage travel ticket is what you have been looking for. The classic design provides you a feeling of nostalgia and would take you back to the good old days. For the content, you can include your personal or corporate branding elements, such as the company name, logo design, business address, and contact information. This ticket also contains a unique ticket bar code or identification number which is used in confirming the authenticity of the ticket. 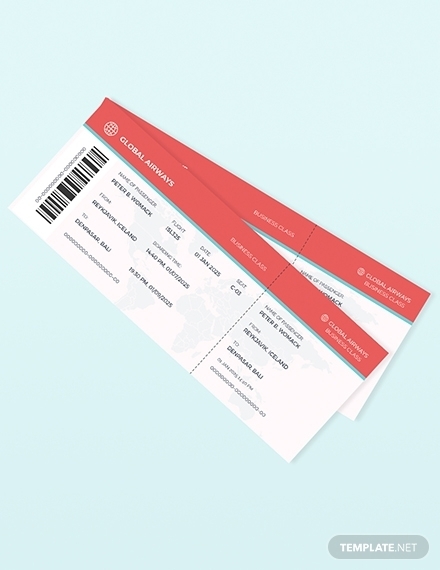 Whether you are an airline company or a graphic designer seeking ticket ideas for your own airline ticket, this travel ticket template can help you achieve a classy and exquisite personality for your ticket design. You can edit and personalize the content and include your company branding so that more and more people will get to know about you through your ticket. Another unique feature of this ticket is its QR code. Instead of manually checking and verifying the ticket or inputting the bar code, scanning the QR code is the fastest alternative. Get more extra creative with your invitation with the use of this well-designed travel ticket invitation. With this, it would be easy for you to inform your guests of an upcoming VIP event that must not be missed. This eye-catching ticket design is very convenient to use since it is readily downloadable and customizable. It comes in many file formats, such as Illustrator, MS Word, Pages, Photoshop, and Publisher. 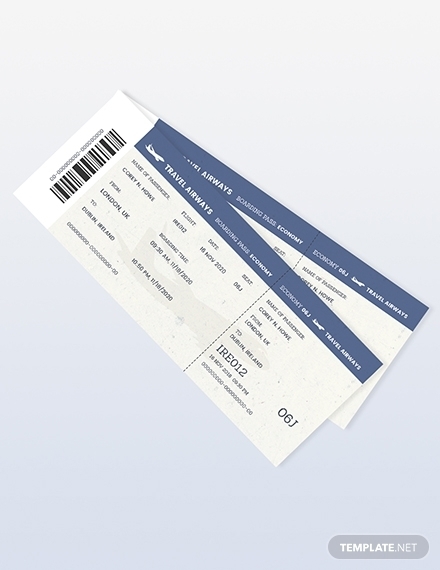 Create a formal yet artsy airline ticket using this well-made boarding ticket which comes in a high-resolution image and comes with high-quality graphic designs. So, when you are an airline company looking for the best ticket, you have surely come to the right place. You can customize this ticket to fit your company’s ticket preferences. 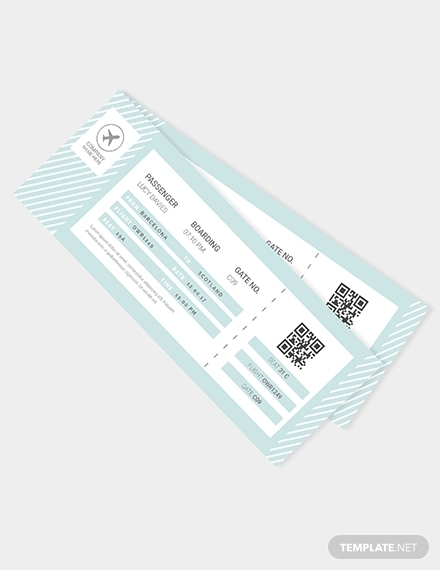 You can also input the important ticket elements, such as your company information, ticket information, graphics and illustrations, and unique serial number or QR code. Lastly, do not forget to include the terms and conditions of your ticket. No matter the age of the celebrant, birthday celebrations can be fun with costumes or themes. Apart from the venue, you may also design your birthday invitation to fit your theme. 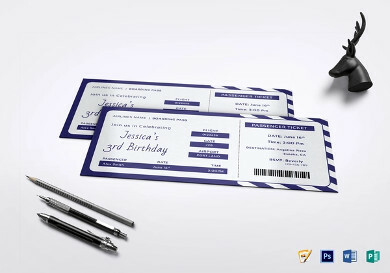 So, for birthday celebrants who love or want to travel, this birthday boarding pass invitation ticket is an appropriate design for your invitation. It may also serve as an admission ticket to the venue of the birthday event, thus serving a dual purpose as an invitation and, at the same time, a ticket. This can be printed and sent to your recipients or can be sent electronically or digitally. Professionally designed and delicately crafted, this simple plane ticket is the best option for those individuals who want minimalist designs and for those companies who want to maintain an elegant personality. Because of its editable feature, many marketers would surely get hooked in using the template and the convenience of the user is guaranteed. 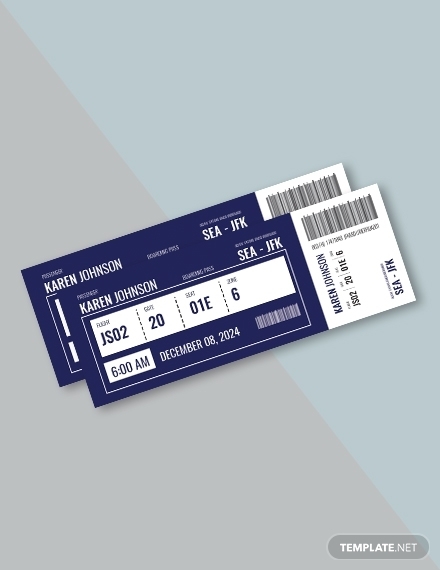 You can incorporate the details regarding your own personal ticket by editing this template in computer applications or programs that can open Illustrator, Photoshop, MS Word, Publisher, and Apple Pages file formats. This is an example of a ticket issued by Philippine Airlines, displaying information regarding the departure and arrival of the passenger as well as the duration of the travel. Also indicated is the price of the ticket, the type of accommodation or travel class, and the terms and conditions regarding the purchase of the ticket. Notice that the logo is present and comes in high quality. Overall, the design is minimal, yet it creates an impact because it is neat and well-organized. The Saudia Airline, the national carrier airline of Saudi Arabia, has their own unique way of presenting their ticket. They have a consistent branding design in all their marketing materials including their plane ticket. The logo is presented in both top corners of the ticket along with the color that represents the company. It clearly indicates the information of the passenger, seat number, and travel information. The QR code is carefully placed near the middle, making it immediately visible and noticeable. 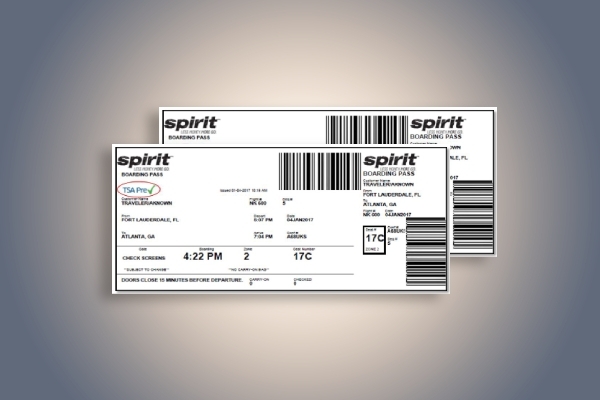 In this example, this ticket issued by Spirit Airlines, an American ultra-low-cost carrier, has a very simple and basic design but can capture the attention of the audience because the information on the ticket is presented in an organized manner. 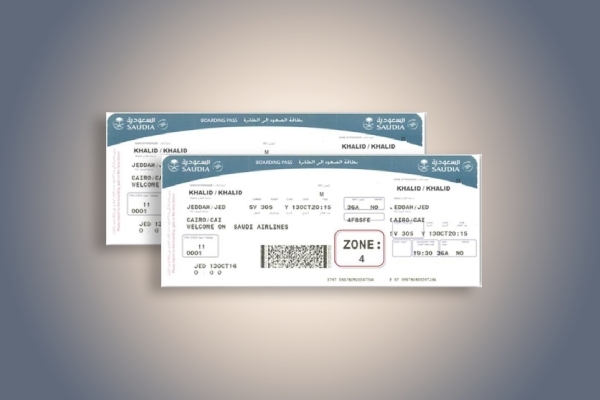 Needless to say, the company logo is indicated on top just like in any other plane ticket designs, the passenger’s information on the left, the flight and travel information in the middle, and the summary as well as the serial code on the right. This United Airlines boarding pass ticket has elements that are carefully organized to fit into the small area of the ticket. The flight information, which is the passenger’s main concern, is clearly indicated in the middle, such as the start and end time of boarding, departure time, and arrival time. 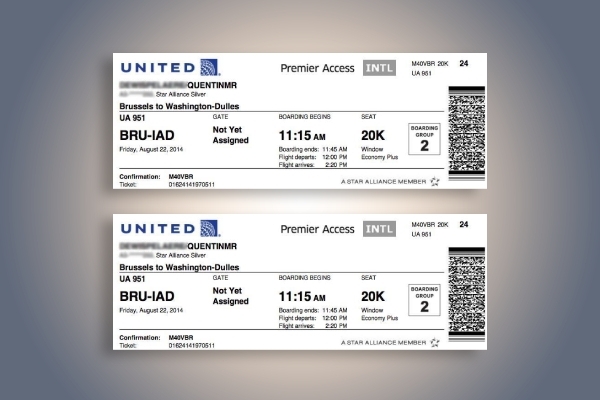 The ticket number and confirmation code, being not the primary concern of the passenger, is placed at the bottom left corner of the paper, but it is still visible and can easily be read.